Thirty years ago this month, America’s favorite animated family made their debut as part of The Tracey Ullman Show. 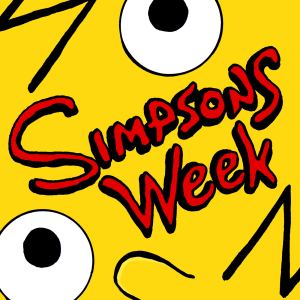 To celebrate, CoS has been broadcasting live from Springfield all week with a slew of Simpsons features. Today, the shenanigans come to an end with an oldie but a goodie: a round-up of 10 musicians who have yet to appear on the show, complete with episode ideas. Be forewarned, this feature originally ran back in 2013, which is why you’ll see one Starman in the pages ahead. Still, there’s reason to believe The Thin White Duke could still visit Springfield with a little magic. I require a momentary pause before answering the question “How old are you?” And yet, flip on a rerun of The Simpsons and I can quote, line for line, every character interaction over a 22 minute episode — 44 minutes if you count “Who Shot Mr. Burns: Part 1” and “Part 2”. To some, this compromise of essential memory in place of useless dialogue recollection is a cruel joke. But for a guy who makes his living discussing pop culture and music, it’s a worthy sacrifice. Like brain synapses dulled over time, The Simpsons is not as sharp as it once was. Seasons three through eight are still a fabled goldmine of pre-internet parody and witty subversion. The Springfield residents had not yet become parodies of themselves and the guests performers — especially the musical ones — did not feel shoehorned. Over the last 15 – perhaps due to the success of Family Guy and the fleeting window of viral fame — far too many acts pop in to advance a single throw away joke rather than weave their presence cleverly throughout the story-arc. What was once crucial to the outcome — see Michael Jackson’s engaging, uncredited role as a mental patient in “Stark Raving Dad” – has now devolved into Katy Perry inexplicably dropping by to sing cheeky Christmas Carols. But, crotchety cynicism aside, the staff at CoS would be remiss if we didn’t extend our own salute to one of the funniest shows to ever grace the small screen, especially now during music festival season. Thus, in honor of Lollapalooza, Homerpalooza, and The Us Festival, we present our own wish list of musical acts who have yet to appear on The Simpsons. Are we being sarcastic dudes? I don’t even know anymore.